Ball, a former pharmacist who lost his first attempt to win a seat in the General Assembly in 2003, subsequently won a by-election contest in 2007 by a margin of just 18 votes in the northern electoral district of Humber Valley. After the Liberals failed to win the 2011 provincial election, Ball was appointed as interim leader, and he won the permanent leadership in the December 2013 leadership race. Ball’s platform included a promise to end Davis’s plan to raise the provincial sales tax from 13% to 15%, even though revenues are set to decline with global oil prices and, accordingly, the province’s newly found oil wealth. 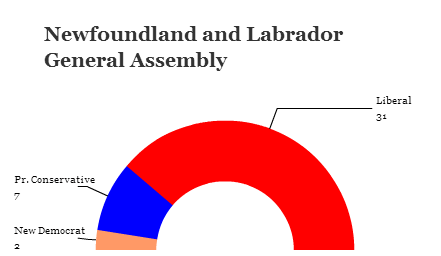 Despite the timing, however, the Liberal victory in Canada’s easternmost province depended little on Trudeau’s popularity (though the Liberals won all of the province’s seven seats in the House of Commons). Instead, it has to do with a Progressive Conservative government that stagnated in recent years after the wildly popular Williams left politics in 2010 for the private sector. The Liberal rout owes much to a series of unforced errors in the post-Williams era that only accelerated after the 2011 election. Williams led the Progressive Conservative Party to a staggering victory in the 2003 provincial elections, and his tenure coincided with the province’s economic rebound as it shifted from the disastrous effects of a 1992 moratorium on coastal fishing to an economy based on tourism and offshore oil production. Though Williams came into office and immediately cut the government’s spending, he won over voters by defending the province’s interests in keeping more of its offshore oil revenues vis-à-vis the federal government. At one point in December 2004, Williams escalated a fight with then-prime minister Paul Martin by ordering all Canadian flags removed from provincial government buildings. 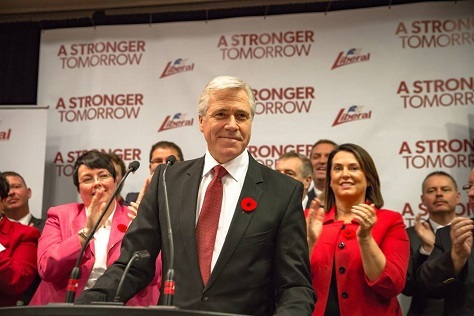 In 2008, Williams turned his ire towards Conservative prime minister Stephen Harper after Harper failed to uphold a pledge to exclude Newfoundland’s oil revenues from the equalization formula that determines federal payments to the provinces. Williams stoked a rising surge of nationalist sentiment among Newfoundlanders, who joined the Canadian federation only in 1949. Kathy Dunderdale, Williams’s successor, maintained the Tory majority after the 2011 elections, but her popularity steadily plummeted and by January 2014, Dunderdale resigned in the wake of widely unpopular rolling blackouts across the province. Businessman Frank Coleman was set to succeed Dunderdale in June 2014, but he suddenly and mysteriously withdrew from the leadership just days before his scheduled swearing-in as premier, citing a grave personal family matter. That effectively threw the Progressive Conservatives into further disarray, necessitating a fresh leadership election in September 2014. Though health minister Paul Davis won a narrow victory over former minister John Ottenheimer, the dynamics of the provincial election were already set. Previous PostBurkina Faso’s election is just the beginning of its transitionNext PostWho is Hilary Benn?